Floating hour and minute wheels telling directly the time, with no hands. Wheels and cannon pinion elegantly maximized with embedded precious stones (lacquered finish in shown prototype) to indicate the time, in an unprecedented and ethereal manner. Symmetric case, no crown. 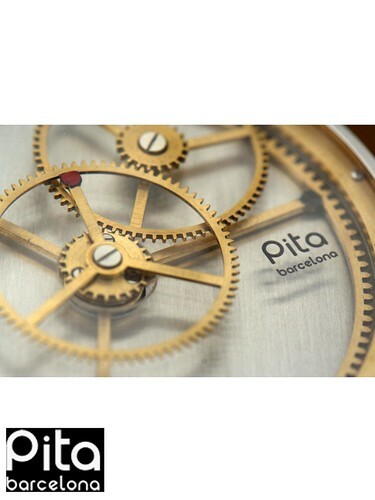 Pita-005 movement featuring patented Pita-TSM System (Time Setting Mechanism), replacing remontoire and winding systems by our idea. Fully customizable. 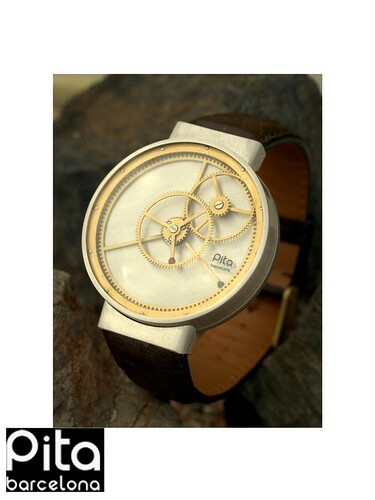 Unlimited assortment of dials, straps and buckles to choose from. Designed and handmade in Barcelona. Pita Molinos 2011 edition numbered and limited to 5 units. Available from November 2011 in 18 ct. Yellow/White/Rose Gold, or Platinum 950. Now accepting reservations.